Kale has a lively pungent flavor, somewhat like a cross between cabbage and spinach with delicious, peppery notes. This leafy green powerhouse delivers more nutritional value for fewer calories than just about any other food. Get the Torn Kale Salad Jammin’ Rice Vinaigrette recipe here! One of the best sources of vitamins A, C and K, kale is a very good source of copper, potassium, iron, manganese and phosphorus. Just one cup of cooked kale contains more then 1000 percent of the daily value of vitamin K and more than 150 percent of the daily value for vitamin A and beta-carotene. Most people are not aware of Vitamin K. Long known for its critical role in blood clotting, vitamin K is also important for forming and maintaining strong bones.Kale also contains the health-promoting phytonutrients, zeaxanthin and lutein, which promote eye health. 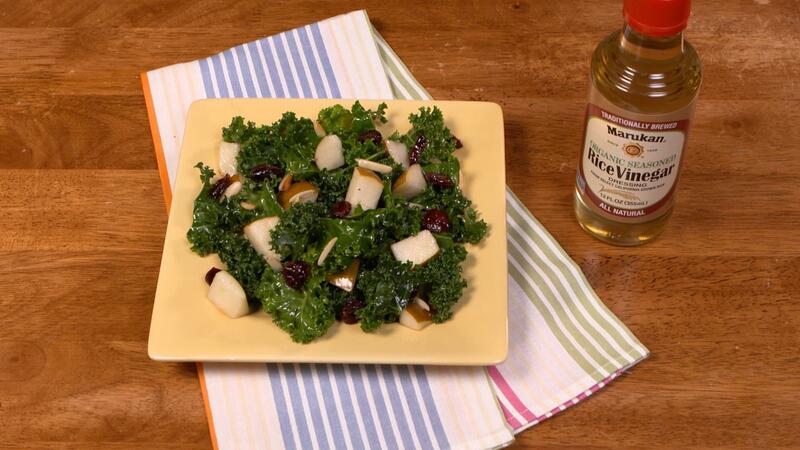 A great addition to soup or a sauté, kale can be braised, baked or marinated and is a great foundation for salads. The leaves are torn from the ribs, which are discarded. Kale is super fibrous and different from lettuce or spinach in that it will soften a bit when left to marinate in the dressing for 10 minutes or so. So much more than the endlessly hip kale salads popping up everywhere, Torn Kale Salad and Jammin’ Rice Vinaigrette is a delightful dish that balances the deep, earthy flavor of torn kale with the fruitiness of fresh ripe pears and sweet dried cranberries with slivered almonds adding a tasty crunch. The dressing is a luscious blend of strawberry jam, fresh lemon juice and equal parts extra virgin olive oil and seasoned rice vinegar. In this quick and easy recipe Marukan Organic Seasoned Rice Vinegar adds crucial sweet, salty and tangy elements to a dish that is sure to become a favorite. Marie Oser is a best-selling author, writer/producer and host of VegTV. Her latest book is The Skinny on Soy. Follow Marie on Facebook and Twitter! Krinsky NI, Landrum JT, Bone RA. Biologic mechanisms of the protective role of lutein and zeaxanthin in the eye. Annu Rev Nutr.2003;23:171-201.Annu Rev Nutr.2003;23:171-201.